Dr. Ananda Basu, MD., FRCP (UK) is the Harrison Professor of Medicine in the Division of Endocrinology at the University of Virginia. He received his MD degree from Jawaharlal Institute of Post Graduate Medical Education and Research (JIPMER) in Pondicherry, India in 1986 and thereafter trained in Endocrinology at the General Hospital in Birmingham, UK. In 1993, he joined the Mayo Clinic in Rochester, MN where he trained as a clinician-investigator in the area of integrative physiology of diabetes in the laboratory of Dr. Robert Rizza along with a clinical fellowship in Endocrinology. Thereafter, he joined the Mayo faculty in 2000 where he rose to the rank of full Professor in 2011. He was recently recruited to the UVA faculty as part of a strategic initiative to bolster the clinical component of the Center of Diabetes Technology and translational physiology research in type 1 diabetes at UVA. Dr. Basu is currently the Principal Investigator of two NIH funded projects that are designed to better understand the physiology of type 1 diabetes. These include: i) NIDDK-DP3-106785 that attempts to recreate a truly electronic beta cell by infusing insulin and amylin (hormones released by the normal beta cell) in a closed loop system to test the safety and efficacy of the combination therapy in those with type 1 diabetes; ii) NIDDK-R01-085516 that seeks to understand the altered physiology of the alpha cell by using stable, non-radioactive isotopes of glucagon as truly innovative probes to understand the dynamics of glucagon secretion and its metabolism in humans with and without type 1 diabetes. Dr. Basu is also a co-investigator in NIH and Industry funded projects with Dr. Rita Basu MD as the Principal Investigator. He is also a consultant in a project that seeks to introduce the first indigenous artificial pancreas for patients with type 1 diabetes in India. As a clinician-leader, Dr. Basu has had extensive experience. He led the large, multidisciplinary Hospital Diabetes Oversight Group and the Diabetes Consult Service comprising ~25 Nurse-Practitioners and endocrinologists for more than 12 years at the Mayo Clinic Hospitals in Rochester, MN. During this period he helped standardize and protocolize care of the hyperglycemic patient both in the ICUs and on the hospital floors. He also led numerous Quality Improvement projects that helped improved safety and efficacy outcomes both for patients and nursing staff in the hospitals. This included hospital-wide reductions in rates of hyperglycemia and hypoglycemia; protocolized management of medical emergencies like diabetes keto-acidosis; instituted carbohydrate counting for all hospitalized patients on insulin; reduced needlestick injuries to nursing staff related to insulin administration; developed hospital-wide electronic surveillance system for point of care glucose monitoring and numerous other standardized order sets and protocols. He also started the cardio-metabolic clinic and was a co-founder of the diabetes technology clinic during his tenure there. 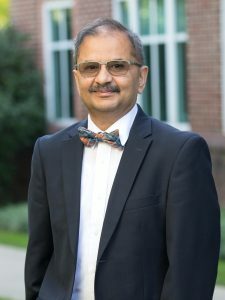 At UVA, besides continuing his physiology research into type 1 diabetes, Dr. Basu plans to develop and start an outpatient Diabetes Technology Clinic while applying state of the art cloud-based decision support systems that has been developed at the Center for Diabetes Technology at UVA. This will provide an innovative and futuristic model of care that could be the benchmark for modern technology-assisted management and care of the diabetic patient not only throughout UVA but within the state of Virginia and eventually across state-lines. Additionally he will work towards improving management of the hyperglycemic hospitalized patient at UVA hospitals in an effort to improve outcomes. Dr. Basu is the author of almost 200 peer-reviewed publications in major journals including the New England Journal of Medicine, Journal of Clinical Investigation and Diabetes. He has been on the editorial board of Diabetes Care, a flagship journal of the American Diabetes Association and currently is an Associate editor of the Diabetes Technology and Therapeutics journal. He has served as a grants reviewer for the National Institutes of Health for many years. He has received numerous awards as a clinician and teacher during his career. He has actively participated as a WHO fellow in a 5-year international program that educated several hundred promising diabetologists in China and Europe. Expertise: diabetes integrative physiology investigations, diabetes technology clinic, isotope dilution techniques, hospital diabetes management.